We aren't even particularly busy. It's more like... we're gettin' ready. Gettin' ready to paint birdhouses and feeders. Going to the store to get ready to make a fancy coffee cake for a tea party. 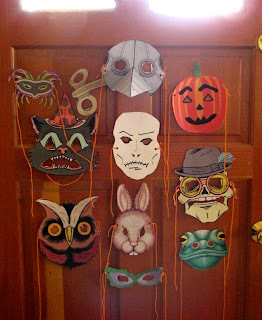 Gettin' masks ready for little dolls and friends that want to wear one for a tea party. And wearing them around the house, of course. Gettin' ready to dry apples to hang outside for our bird friends. Gettin' ready to make peanut butter and birdseed pinecones for the same friends. Gettin' ready to play Carmen Sandiego. Gettin' ready to sew a first project - napkins for the dolls for tea parties. I'm not feeling like our life is on hold. I don't feel like we're not accomplishing anything, or missing out on Grand Adventures. It just feels right, this place. We have tons of ideas of things we'll do. As soon as we're done with this Nothing space. i love piddling. just the thought of piddling makes me swoon. We have quite a few SD games! The problem is that they're all for old operating systems, and our oldest one is XP Pro. So it's a tricky business getting them to run! But we love love love them. Nice to see you here again, btw. See you when you get back to your blog!